Every now and then your exhaust needs replacing. The harsh weather and salt on the road lead to the exhaust deteriorating and splitting. Unfortunately, there’s nothing that you can do to prevent this apart from buying quality exhausts. This is where Cadnam Garage Services in Cadnam, Southampton will help you. We offer you affordable options to replace your exhausts, whether you need a partial replacement or an entirely new exhaust system. We know that money is tight and you don’t want to spend hundreds of pounds fixing your car. At Cadnam Garage Services, we work with manufacturers to offer quality at an affordable price. 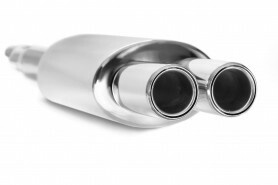 While being affordable, all the exhausts and components we supply are of the best quality. Affordable does not mean you should have to keep replacing your items on a regular basis – that just defeats the object of keeping the cost down! All manufacturers and suppliers Cadnam Garage Services works with offer the best quality to help protect your exhaust and slow down the degrading process. As well as supplying exhausts to customers in Cadnam, Southampton, we believe in offering a professional service at all times. Cadnam Garage Services in Cadnam, Southampton only employs professional and fully qualified mechanics. They will find the exact problem with your car exhaust and replace only the parts that need it. Along with that, we promise to offer a friendly service to all customers. From the minute you walk into Cadnam Garage Services, we will offer a service to be proud of. It does not matter if you are a new customer or a returning one. At Cadnam Garage Services, we believe that customer service is a major factor in running a successful car garage in Cadnam, Southampton.